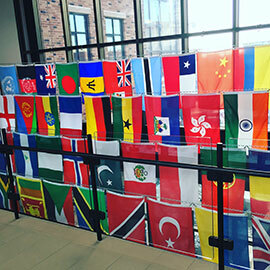 Brantford – Wilfrid Laurier University’s Brantford campus is celebrating its diversity with the grand opening of its Hall of Nations, Feb. 15 at 1 p.m., in the Davis Fuels Walkway. Approximately 50 flags will be hung in the Hall of Nations, each recognizing the country of origin or Aboriginal community of a current student on campus. “Thanks to a generous donation from the Student Life Levy, we are able to celebrate the incredible diversity within our student population on campus,” says Jessi Calberry, coordinator: Centre for Student Life and Engagement. The Hall of Nations, a joint effort between the Centre for Student Life & Engagement, Laurier International and the Dean of Students Office, is an ongoing project that celebrates Laurier’s student community. Flags represented in the Hall of Nations include: Afghanistan, Australia, Bangladesh, Barbados, Botswana, Chile, China, Colombia, Croatia, Czech Republic, Ecuador, Egypt, England, Eritrea, Ethiopia, France, Germany, Ghana, Haiti, Hong Kong, India, Iraq, Ireland, Jamaica, Jordan, Myanmar, Netherlands, Nigeria, Norway, Pakistan, Peru, Poland, Portugal, Romania, Russia, Rwanda, Saint Vincent and the Grenadines, Saudi Arabia, Somalia, Sri Lanka, Tanzania, Trinidad and Tobago, Turkey, Ukraine, United Kingdom, United States of America, Vietnam, Zimbabwe, and five flags recognizing students from first nations territories: Haudenosaunee Confederacy, Mississaugas of the New Credit First Nation, Anishinabek Nation, Metis Nation of Ontario, and Qalipu Mi’kmaq First Nation. The flags will be updated on an ongoing basis. A similar project was established on Laurier’s Waterloo campus in 2010, with flags hanging in the campus-dining hall.